NEW DELHI, INDIA - : Microsoft India released their 2017 India Citizenship Report this week. The report captures an overview of the company’s citizenship programs and impact in the one-year period between April 2016 and March 2017. 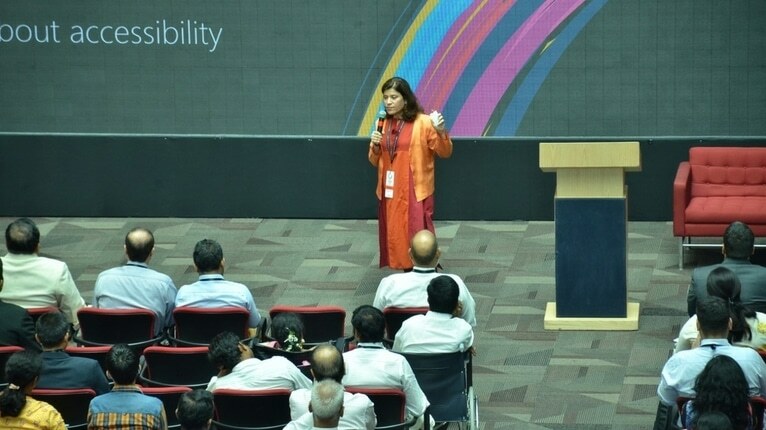 In 2016-17, Microsoft extended support to over 4000 Indian start-ups, supported skill trainings for 30,000 youth, helped train 26,000 teachers, working closely with many government departments, industry bodies and not-for-profit organizations in the country. During the year, Microsoft supported over 4000 entrepreneurs to build their business, scale up, and grow. ●BizSpark, a Microsoft flagship initiative, is a one-year program aimed at supporting early stage start-ups. BizSpark Plus program allows these start-ups with a working prototype to accelerate innovation and get their products and services to customers as quickly as possible. ●Microsoft Accelerator is a global program built to empower start-ups in their journey to build great companies. The program entails working with market-ready start-ups to provide tools, resources, connections, knowledge, and expertise. ●Microsoft’s Partner Accelerator helped GenNext Hub (has successfully graduated 4 cohorts with more than 52 start-ups), AIM Smart City and Brigade Group (has successfully enabled 5 start-ups). ●Cloud training programs such as Azure Vidyapeeth and GuruVarta provide assistance to upskill partners and enable them to help over 10,000 SMBs across 250 cities across India to move to the cloud. Microsoft’s various education and skill development programs helped train 30,000 youth and 26,000 teachers during the year. ●In 2016-17, under Project Shiksha over 8124 teachers were trained, especially in Tamil Nadu, Rajasthan and Madhya Pradesh, positively impacting 361,000 students. ●Project Saksham has equipped institutes of higher education to digitize, build technology-enabled content repositories and schedule online sessions. Over the years, Microsoft has conducted trainings for over 3,307 educators across 123 universities. In 2016-17, 661 teachers across 21 universities were trained. ●As part of the Microsoft Educator Community program, in June 2016, the Government of Maharashtra adopted the QR Coded textbook idea catalyzed by a Microsoft India Educator – Mr. Rajintsinh Disale, which allows teachers to receive additional resources and information related to a textbook by simply scanning a QR code. ●Other initiatives such as the Microsoft Academia Accelerator and the Microsoft India Research Indian Summer School (175 students have received internships in 2017 through RX Labs) have received positive response from students and faculty alike, in the past year. Microsoft India is bringing the machine learning and artificial intelligence to solve healthcare, agriculture and education challenges. ●In December 2016 in partnership with five global eyecare partners, Microsoft India announced the Microsoft Intelligent Network for Eyecare (MINE) – a mission-driven global consortium of like-minded commercial, research, and academic institutions that collectively work on diverse datasets, including the rate of change of myopia in children, conditions that impact children’s eyesight, predictive outcomes of refractive surgery, optimal surgery parameters, as well as ways to personalize a surgery. ●The ‘Digital Village’ project in Harisal – a partnership with the government of Maharashtra and other industry partners created a technology-enabled village with a provision for Internet and digital literacy. Microsoft is investing to create a more equitable future and is committed to bringing the benefits of technology to people who need them the most, as well as to non-profit organizations that are working to address humanity’s pressing issues. Microsoft Philanthropies has invested over 10 million USD in cash and technology to transform the way non-profits deliver impact in India, offering educational opportunities to the next generation, and extending support during humanitarian crises. Microsoft’s YouthSpark program helped train 30,000 youth and helped 18,000 of these people find jobs. ●Microsoft has partnered with the Digital Empowerment Foundation and launched DigiKala which has so far touched more than 22,000 weavers and 9,000 handloom stations in Odisha.